Does a pound of history amount to a hill of beans? 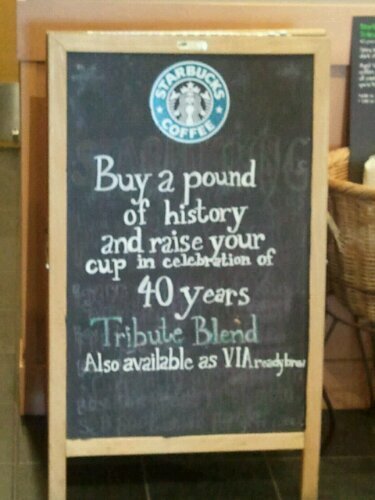 Starbucks seems to think so. It’s pushing the history angle pretty hard in its 40th anniversary marketing campaign. Tenspotting. Chock full of “best ever” lists. 28 Weird Al Yankovic Parodies (1983-2006). Speaks for itself. Unfortunately, all the video links have been removed from YouTube. More from the grocery check-out. I suppose I understand the pairing of John-John and Diana. 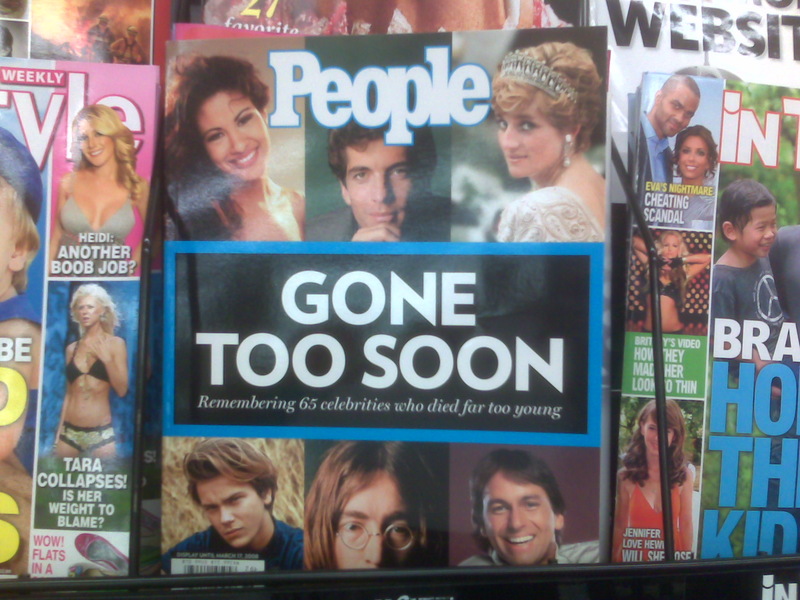 But John Lennon and John Ritter? So the picture is horrible, but the show was great. Friday night I was fortunate enough to catch The Police in Hershey, PA, and I have to say it was one of the best reunion concerts I have seen. 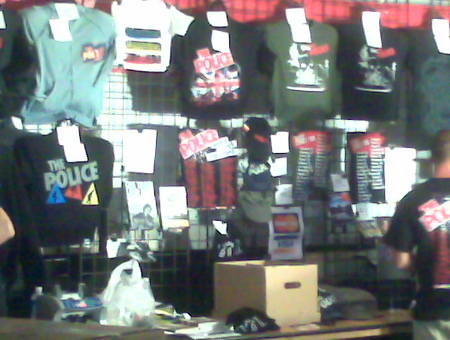 As this cell phone picture of the t-shirt tent attempts to show, both the crowd and the band exhibited their fair share of sentimentality and nostalgia: cover art from Outlandos d’Amour, Regatta de Blanc, and Synchronicity was much in evidence. Despite the throwback visuals, however, The Police and their music seemed surprisingly fresh and relevant. You could almost imagine them doing something interesting in the recording studio—a claim you wouldn’t make of other recent reunion acts like The Who, The Eagles, or Fleetwood Mac. Sting in particular went a long way towards rehabilitating his rock star credentials and winning me back as a fan. After several tired years of tantric spirituality, bad lute music, and cheesy troubadour costumes, it was nice to see him rock out in spiked hair, a torn t-shirt, and a used up bass guitar. That, of course, is my own nostalgia at work, but as Rob MacDougall might observe, sometimes old is truly the new new. I was refilling our salt shakers last night when I noticed this little tidbit on the side of the can. It turns out my can is part of a series. 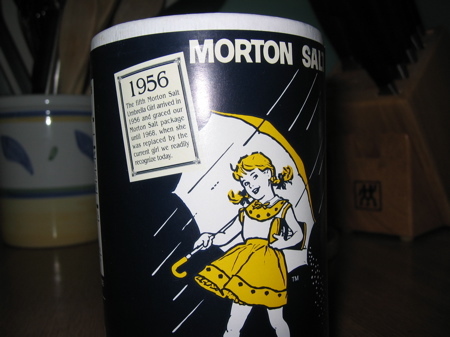 In addition to the 1956 Umbrella Girl, Morton’s is printing throwbacks from 1914, 1921, 1933, and 1941. Collect them all at your local supermarket … or maybe just visit Morton’s website. 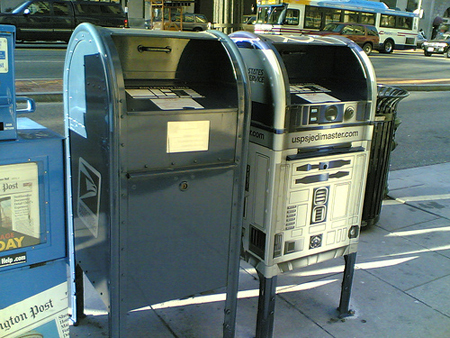 To commemorate 30 years of Star Wars, the United States Postal Service has started painting its blue corner mailboxes to look like R2-D2, the lovable droid who first appeared in 1977. I was three years old when A New Hope premiered, and standing in line for tickets with my parents outside Showcase Cinemas in Worcester, Mass. is one of my earliest memories. I’m not sure I need the post office to remind me how old I am, but as I child of Star Wars I appreciate the gesture nevertheless. Upadate (3/30/07): So it turns out that the mailboxes have been installed to promote a series of Star Wars commemorative stamps. No surprise there, I suppose. Imagine wandering into your living room after a day of work. You sit down in your chair and turn a dial to 1973. The stereo adjusts automatically, streaming Bob Marley, Elton John, Stevie Wonder and Jim Croce. LCD panels hanging on the wall switch to display Roberto Matta’s Jazz Bande and Elizabeth Murray’s Wave Painting. If you check your TV listings, you’ll find Mean Streets, Paper Moon, American Graffiti, The Sting, Last Tango in Paris … even Are You Being Served? In your newspaper you find stories about the cease-fire in Vietnam, about Watergate, about Skylab, about worldwide recession and OPEC and hostilities in the Middle East. If you want to read a novel instead, you might try Gravity’s Rainbow or Breakfast of Champions. Turkel goes on to suggest a kludge of current and near-horizon technologies that could fulfill this vision. Though plausible, I suspect we’re still some way off from a history appliance that the average consumer could install and operate. But the idea is very compelling. I agree wholeheartedly with Bill that such a device would present fantastic opportunities for public historians, and it seems to me that even if we have to wait a while for the home version, museums could start working on this now for their galleries. First and foremost, “history appliances” would allow public historians to provide audiences with the kind of deep historical immersion that’s currently only available through years of long study. Sometime in the depths of their researches, I think all professional historians have experienced fleeting moments of time travel. “Turkel’s Time Machine,” if it ever comes to pass, could offer something similar to lay publics at the turn of a dial. A couple months ago, my friend Rob sent me a link to a great piece in the Washington Post that I somehow forgot to post. “A Homer’s Odyssey” reports the efforts of Greenbelt, Maryland resident Mark Opasnick to preserve and extend local historical memory in the Washington, DC area. A Montgomery County Income Assistance Specialist (read “welfare officer”) by occupation, Opasnick is a collector of “miscellaneous and unknown” pieces of local history by preoccupation, especially moments of local color in pop culture history such as the story of Jim Morrison’s romantic escapades at Alexandria’s George Washington High School or that of the disturbed Cottage City boy who inspired The Exorcist books and movies. Described as an “archaeologist” of local history, Opasnick has a particular penchant for producing digests and catalogs, for example his Maryland Bigfoot Digest, an accounting of more than 300 reported Sasquatch sightings over Marlyand’s nearly 400 year history. But whether you call it “archaeology,” “collecting,” or something else, the Post article makes it clear that Opasnick’s work represents a tremendous amount of documentary research. 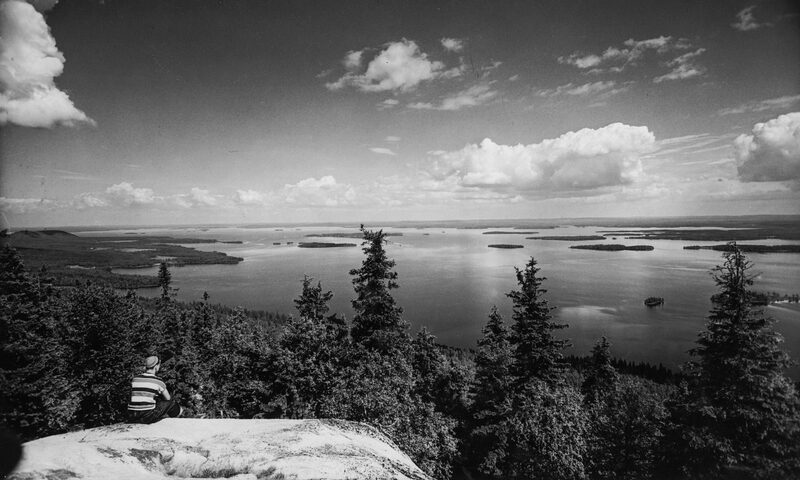 Many communities are fortunate to have local history enthusiasts like Mark Opasnick. I suspect the amount of research produced by these thousands of local historians vastly exceeds the amount of research done by professional historians, and though it certainly adheres to a different set of standards and asks and answers a different set of questions, it is regrettable for amateurs and professionals alike that this enormous body of work remains almost infinitely fragmented and almost totally inaccessible. I launched this blog in part to start some of the work of corralling this scattered corpus, but a couple of anecdotal and accidental posts a week won’t get us very far. Worse, my haphazard approach can only point to work that has already been exposed in one way or another: it can’t ferret out the research that’s sitting on kitchen tables and in home offices all around the world. We would all do well to devise some kind of mechanism, either social or technological (a Zotero hub? ), to expose and circulate this untapped reservoir of amateur historical knowledge. We pros would also do well simply to start talking to amateur local historians. As it stands, practitioners of “local” history in the academy are loath even to share a label with their amateur counterparts, preferring instead to call themselves “urban historians” or even “environmental historians.” In some ways, the American Association of State and Local History and its members occupy a middle ground between amateurs and academics, but they represent less a bridge between the other two than a third distinct community. This separation isn’t good for anyone. If we acknowledged our commonalities instead of highlighting our differences and came up with some way to communicate and share our results, we professionals could help amateurs ask and answer questions that are more, let’s say, productive. However, I’m not sure we really even know what questions amateurs ask. We suspect these questions to be narrow, self-serving, value-laden, etc., but surely in that vast body of research activity there exists some subtlety—probably some subtleties we haven’t even reached ourselves. These things are not unknowable, especially in this world of Web 2.0, and we should start seeking them out. Last night I stayed out a little too late for a Thursday, but that doesn’t mean I slacked off completely. 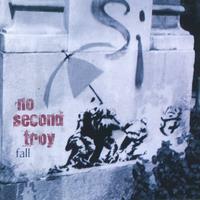 I spent the evening at the Rock and Roll Hotel listening to No Second Troy, a local band whose guitarist is a friend of my wife. Their name is an allusion to the Yeats poem of the same name, which is itself an allusion to Homer’s Iliad. Moreover, the stickers they handed out featured this image from one of their recent album covers, putting us in mind of Iwo Jima as well. By my count, that’s three good pieces of found history in one smokey club. Not bad for a night out.